Here is another point of perfect balance on the journey through the Wheel of the Year, its counterpart being Ostara or the Spring Equinox. Night and day are again of equal length and in perfect equilibrium – dark and light, masculine and feminine, inner and outer, in balance. But we are again on the cusp of transition and from now the year now begins to wane and from this moment darkness begins to defeat the light. The cycle of the natural world is moving towards completion, the Sun’s power is waning and from now on the nights grow longer and the days are are shorter and cooler. The sap of trees returns back to their roots deep in the earth, changing the green of summer to the fire of autumn, to the flaming reds, oranges and golds. We are returning to the dark from whence we came. 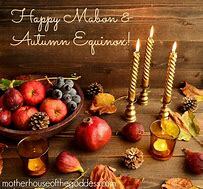 Posted on September 21, 2018 by Lady BeltanePosted in Fall Equinox/Mabon, Gods, Pagan History, Rituals, SabbatsTagged Autumn Equinox, Mabon, Pagan, Solitary Practitioner, Wicca, Witchcraft.